If you need that extra space then a mezzanine floor may provide the solution, CMC are a highly acclaimed storage company with plenty of experience in making the best possible use of a limited space. We have an extensive range of mezzanine floors on offer and all at the best possible prices. 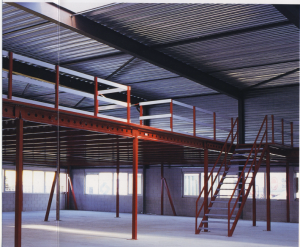 If you need top quality mezzanine floors in London then we can cater for your needs. As well as our mezzanine floor selection we have lots of other products on offer, including archive storage racking, pallet racking, longspan shelving, Dexion shelving, slotted angle shelving and British standard shelving. For more specific requests ask about our cantilever racking and other heavy duty racking. One of our staff will be more than willing to arrange an appointment and site visit to discuss in detail what your requirements are for mezzanine flooring in London. We will even make all calculations on site to work out exactly the amount of mezzanine floors you need? As you can imagine, CMC have a constantly changing stock, with new mezzanine floors and shelving coming into our showroom. For information regarding our new or used mezzanine floors in London please call 020 8998 9247. We will always ensure your mezzanine floors reach you in the best possible condition and at the best possible prices. If you would like any further information regarding our selection of mezzanine floors then please feel free to contact us we will be pleased to answer any queries you may have.